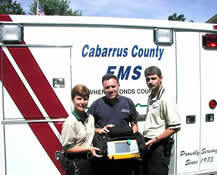 Concord, NC, October 2, 2003 - A new digitized Cardiac and Imaging Information System at NorthEast Medical Center that links Cabarrus County paramedics to cardiologists and emergency medicine teams at Northeast Medical Center has led to a national patient "door-to-dilation" record. "Door-to-dilation" response time includes the time between the patients arrival at a cardiac catheterization lab and the successful completion of an angioplasty procedure to alleviate the effects of a blocked coronary artery. The national average is 104 minutes. The process involves preparing the catheterization (cath) lab to receive the patient, assembling the procedure team, prepping the patient, locating the blockage and inserting a balloon device to reduce pain and symptomsall hopefully before damage from lack of blood flow impacts the heart muscle. Following his exercising at a local gym, a 41-year old resident had chest pains. Upon arrival home, his daughter called the paramedics, who started their evaluation. 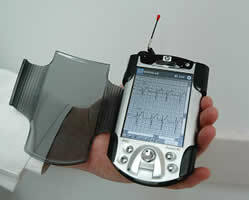 Since June, area paramedics have carried special electrocardiogram (EKG) units capable of transferring digital information direct to a cardiologists handheld computer. While paramedics have used EKGs for years, transmissions were sent directly to the hospital emergency department (ED), where emergency physicians evaluated the EKG. If a heart attack was detected, aggressive treatment began upon patient arrival, generally before a cardiologist arrived. Now if the EKG shows a heart attack, paramedics transmit to the ED where personnel forward it directly to a staff cardiologist. The cardiologist receives a 12 lead EKG transmission, enabling the doctor to view all 12 leads of the EKG simultaneously or enlarge a specific lead for analysis. This early notification allows for assembly of the heart team prior to patient arrival, allowing direct transport to the cath lab. If paramedics have questions or problems, the emergency physician is always available by radio. The patients EKG transmission went straight to Paul Campbell, MD, cardiologist on call at the hospital. Dr. Campbell viewed the EKG reading transmitted from the patients home, and quickly determined he immediately needed a cardiac cath due to blockage of a coronary artery. Without quickly restoring proper blood flow to the heart muscle, the patient could experience heart damage or even death. Dr. Campbells (in picture on the right) order to the paramedic teamthough rehearsed over several monthswas the first to actually say, Direct to Cath Lab. Those words simultaneously activated teams to get staff to the lab and prepare for the patients arrival. When the ambulance pulled into the ED 19 minutes later, the lab was ready for the patient, who bypassed the ED and went straight to the cath lab, where Dr. Campbell and the team met him. The door-to-dilation clock started the moment the patient came through the Cath Lab door, and 33 minutes later Dr. Campbell successfully established good blood flow to the affected coronary artery. Under normal circumstance, it takes 30 minutes just to get the team assembled when the lab is closed or during off hours, but yesterday proved that new technology and training can really pay off, said an elated Dr. Campbell. That new technology and training came in the form of support from The Duke Endowment and William T. Morris Foundation. Together, over $175,000 was funded to provide the local program with field-transmission EKG devices, receiving equipment for the Emergency Department and cardiologists and English and Spanish language materials to increase awareness of early warning signs and symptoms of heart attacks. As part of the project, NorthEast Medical Center and Cabarrus County EMS (Emergency Medical Services) is conducting ongoing clinical research in collaboration with Duke University. 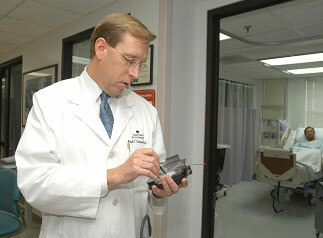 A team of doctors will review analysis and reporting of data collected during the year-long study. Bringing the project to fruition last month was the result of more than two years of research, grant application work and training.